Have the polls “consistently” shown that Scots are opposed to independence? Something that I know has privately frustrated the SNP in recent weeks and months is their perception that the media, especially south of the border but to some extent in Scotland as well, have bought into the anti-independence sideâ€™s narrative about what the polls on the referendum are showing. This echoes the recent efforts of a number of unionist politicians to advance the notion that support for independence has been â€œstuckâ€ for many years or decades. Two senior Conservative politicians, including the partyâ€™s current leader in Scotland, have even made the claim that â€œno poll in historyâ€ has ever shown public backing for independence. The SNP view this as blatant myth-making. So where does the truth lie? Certainly the idea that there has never been a lead for the Yes side in an independence poll is easy enough to debunk. There have in fact been several such polls over the years, including two published since 2008 by TNS-BMRB and its predecessor TNS System Three. The most recent of these was conducted in August 2011, and showed a wafer-thin 39%-38% split in favour of independence. Such polls have tended to attract little or no attention outside Scotland, perhaps due to question marks over TNS’ credibility and track record. However, those concerns have notably not prevented the companyâ€™s more recent polls, showing clear majorities opposed to independence, from being widely reported and treated as authoritative. If we go further back, even pollsters as respected as ICM and YouGov have sometimes shown pro-independence majorities. In November 2006, ICM asked a full-scale sample of Scots if they â€œapprove or disapprove of Scotland becoming an independent countryâ€. 52% of respondents approved, and 35% disapproved. 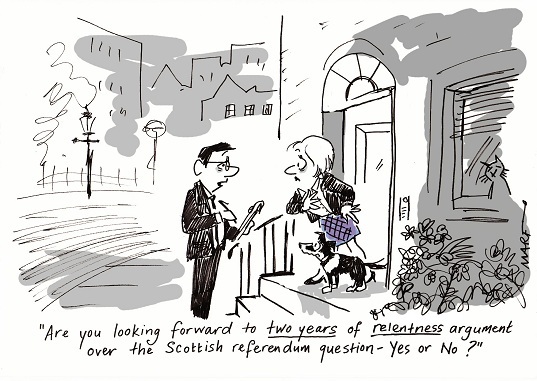 Two months earlier, a YouGov poll had found a 44%-42% plurality in favour of independence. So public opinion on this issue has in truth displayed a considerable degree of fluidity over the years. Why, then, has the narrative of polling â€œconsistencyâ€ taken root so easily in the London-based media? In part, itâ€™s probably because it would be almost impossible for the SNP to aggressively challenge the idea that support for independence is â€œstuckâ€ without drawing attention to the fact that it has actually been moving in the wrong direction of late. More broadly, some nationalists suspect that there is a degree of confirmation bias among non-Scottish journalists and editors, who may not be uniformly hostile to independence, but who are nevertheless much more likely to instinctively dismiss the prospect of it ever happening as rather improbable. What are the implications of this history of polling fluidity for betting on the referendum? Iâ€™ll cop out at this point, and simply note that interpretations may vary. Some will argue that the recent drop in support for independence is a decisive shift in public opinion caused by the focusing of minds on the impending choice, and is unlikely to be reversed. Others will view it as merely a â€œLondon 2012â€ blip, which may be more than offset by the arrival of the Commonwealth Games in Glasgow in referendum year. Nationalist optimists would also see the pro-independence pluralities of past years as being indicative of the existence of a substantial â€œfloatingâ€ segment of the electorate who remain firmly up for grabs now. But whichever interpretation you favour, my advice would be to base any betting judgements on the hard polling figures, rather than on sweeping generalisations about â€œwhat the polls showâ€ â€“ regardless of where those generalisations originate from.